Female entrepreneurs, I am excited to introduce you to your next business mentor, one who wants to help you scale and FAST! Meet Alice: the first ever AI technology for women entrepreneurs. Alice is ready to connect with you no matter where you live in the world and can help you at any stage of business, plus she has knowledge about all industries. Before you call my bluff, I should explain that Alice is actually AI technology, but the software is designed to do exactly what I just described. 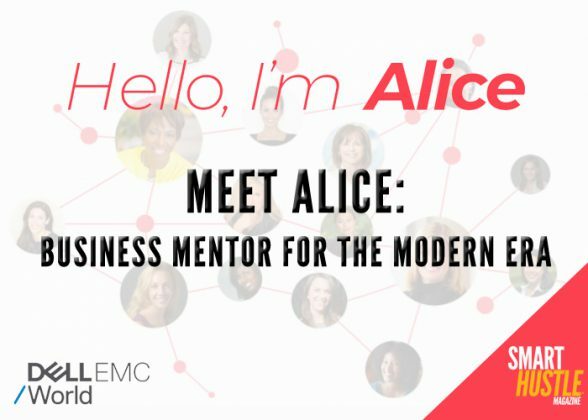 Alice is the brainchild of The Circular Board, and she was officially launched during Dell EMC World 2017. At the event I caught up with Elizabeth Gore, Entrepreneur in Residence at Dell, to learn more about this amazing resource for female entrepreneurs. My interview with Elizabeth is the second in a series of Dell EMC World 2017 videos aimed at giving you an inside look at the latest technological innovations plus tips and advice for small business owners. (If you missed the first episode, you can check that out here.) Elizabeth’s job is “to be the eyes, ears, and voice for fast growth entrepreneurs” and she is passionate about products from Dell and its partners that can help entrepreneurs scale quickly. @ElizabethGore discusses Alice, the online #business mentor for female #entrepreneurs. Visit HelloAlice.com and sign up to get access to Alice, an AI chat bot. Alice will ask you about what industry you’re in, your stage of growth, and your geographic location. Based on your information, Alice will curate for you the most important content to grow your business. You can also ask Alice about your specific pain points, for example raising capital, branding or technology. With targeted advice, Alice can help you through your unique issues and also travel with you throughout the lifecycle of your business. Now is a great time for small business owners to take advantage of technology (like Alice!) to grow their businesses. Check out the video above to learn more about Alice plus Elizabeth’s advice regarding digital transformation and calculated risk…and stay tuned for more Dell EMC World videos in the weeks to come.